Eggplant is eaten in different ways. It is a good ingredient for curry, at the same time tasty snacks can be made out of this fruit vegetable. 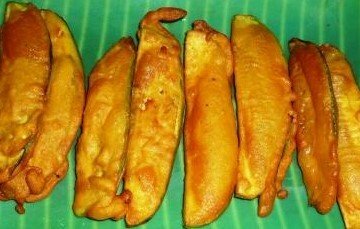 Crispy eggplant fry, commonly known as beguni is hot a favorite, especially during the Ramadan, while the Muslims open their fasting. Eggplant is known as “Brinjal” in South Asia, Southeast Asia, and South Africa. Eggplant is a very common and available vegetable in all around the world. So this recipe is for everyone. 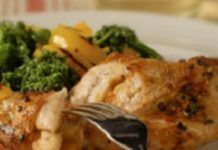 It is a very good recipe for them who wants to cook different types of vegetable. Cooking of beguni is very simple. It is mainly frying, applying batter and frying on oil. Everyone can make this recipe without any complication. Preparation of the batter needs attention about the ratio of 4-5 different flours and powder. This recipe is very healthy. 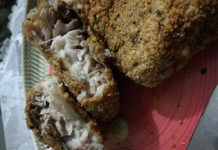 If you check its Nutrition value then you will find that crispy eggplant fry is really a healthy recipe and as well as a delicious food recipe. Due to high in histamines in eggplant, some people has allergies with eggplant. Don’t worry who have the allergy with eggplant they can take one or two pieces of the fries of eggplant because it contains a small amount of eggplant. Cut eggplant into fore and aft thin slices. Wash and rinse it very well. Use a sharp knife or vegetable cutter for cutting eggplant. Add salt and little bit of turmeric powder to the eggplant slice and keep it for 20 minutes. Mix chickpea flour, rice flour, white flour, corn flour, baking powder, salt, chili powder, and turmeric powder. Add normal water as much as you need. (make a thick batter). Add 1 tsp oil to the batter. Keep it for 30 minutes or more. It will be better if you make the batter 2 to 3 hours before frying. Heat the oil in a non-stick frying pan on the burner. If you have a deep fryer, use this for frying. It is very easy to use for frying. Put one slice of eggplant into the batter and fry the both side of eggplant until golden brown. Take out the beguni from the oil in a colander so that extra oil can remove. Transfer the beguni in an absorbent paper-lined tray. The tasty and crispy eggplant fry is ready to eat. Serve this beguni while it is still hot. Serve this with hot tomato sauce or any kind of sauce. This is very good as a snack. If you like my crispy eggplant fry beguni recipe please share this recipe with your family and friends.